Tightening labor markets and rising construction values supported economic growth along the Texas-Mexico border. The unemployment rate was held to a near cycle-low, driving wages above the Texas growth rate. Housing sales rose 1.2 percent, led by gains in Brownsville and El Paso. Single-family building permits trended upward in response to increased demand for new homes. Border housing markets benefited from economic growth, but several challenges lie ahead. NAFTA renegotiations, a slowing Mexican economy, and immigration reform uncertainty present the strongest headwinds to the border economies. Economic activity held steady along the border as historically low unemployment supported positive growth in the Dallas Fed’s Business-Cycle Indices. The McAllen index reached a decade-high 14.3 percent annualized quarter over quarter (QOQ) growth as the labor market tightened. Data revisions halved Laredo’s October growth rate from 10.8 to 5.4 percent QOQ but indicated a steady expansion throughout 2017. In November, the Laredo index grew 6.0 percent QOQ as unemployment hovered below the statewide level. In contrast, revisions dampened the El Paso index’s performance, revealing economic stagnation in the first half of the year. However, economic activity accelerated for the fifth consecutive month, reaching 3.1 percent QOQ growth. The Brownsville index posted the lowest growth at 1.5 percent but remained stable after contracting in the first quarter. The business-cycle expansion boosted border construction values 13.6 percent. Store and restaurant construction in El Paso and McAllen, combined with school construction in Laredo, drove nonresidential construction up 38.1 percent. In the residential sector, construction values improved for the second straight month as single-family housing picked up in every border metro but Laredo. Border employment increased marginally at 1 percent annualized QOQ, adding just 1,400 jobs1. The goods-producing sector stabilized in McAllen after a four-month decline but was unable to lift aggregate annualized growth into positive territory. Payroll expansions in the service sector elevated El Paso’s growth above 3 percent. Declines in education slowed Laredo growth to less than half a percent, while Brownsville’s growth rate contracted 0.7 percent. The labor market stagnated in the Mexican border metros as the Mexican national economy declined. However, Mexican manufacturing and maquiladora employment added more than 16,000 jobs since May, driven primarily by growth in Chihuahua and Reynosa, Mexico. The Mexican border economy remained healthy relative to the rest of the country. Unemployment rates2 along the border remained on a seven-month downward trend. Unemployment drastically improved in Brownsville and McAllen at 6.1 and 6.7 percent, respectively, after surpassing 8 percent earlier this year. In El Paso and Laredo, the unemployment rate ticked up slightly to 3.1 and 4.1 percent, respectively, after reaching all-time lows last month. Falling unemployment supported wage growth in the border economies. Real private hourly earnings increased 3.5 percent year over year (YOY) in McAllen, well above the state growth rate at 0.8 percent. After stagnating in the third quarter, El Paso wages picked up steam and improved 3.9 percent YOY. Hourly earnings increased for the sixth consecutive month in Brownsville, reversing a 19-month contraction but remaining well below the other metros. Surprisingly, Brownsville shed 900 jobs throughout the current wage hike, but a distributional shift towards the goods-producing sector likely generated upward earnings pressure. Construction of a new gas pipeline enabling increased distribution to Mexico supported wage growth despite aggregate employment contractions. On the other hand, Laredo wages stabilized after a 17-month slide as low unemployment and stagnant payroll expansions indicated a shrinking labor force. The peso per dollar exchange rate2 increased to 18.93 after hovering below 18 throughout the third quarter. After accounting for price differentials between the U.S. and Mexico, the real exchange rate rose 3 percent, its largest increase since January 2017. Despite falling Mexican purchasing power, the total value of border trade activity rose 1.4 percent amid gains in both import and export values. El Paso generated most of the export growth while Laredo led in terms of imports. Border housing sales increased 1.2 percent as overall economic activity advanced. Brownsville and El Paso generated all of the gains as sales rose 3.0 and 2.8 percent, respectively. Laredo sales dropped 4 percent, pulling year-to-date (YTD) values into negative territory. In McAllen, housing sales fell for the fourth consecutive month at 2.8 percent, retracting nearly all of the gains made earlier in the year. On the supply side, single-family residential housing construction permits increased 4.7 percent after data revisions calmed last month’s growth from 4.0 to 1.3 percent. El Paso led the expansion with a 10.2 percent increase, fully recovering from its 23.9 percent annual contraction in 2016. McAllen issued the most single-family permits but remained flat for the year. The number of monthly permits issued was significantly lower in Brownsville and Laredo but inched upward 2.6 and 0.8 percent, respectively. The marginal growth in Laredo marks the second month of permit stabilization as builders adjusted to increased housing demand. Increased building permits pushed border construction values up 4.4 percent for private single-family homes, the second largest increase this year. Brownsville posted the largest increase at 13 percent, followed by McAllen at 8.4 percent. Construction values in Laredo fell this month but maintained the highest YTD growth at 10.8 percent. In El Paso, single-family construction values were unchanged after substantial third-quarter improvements. The months of inventory (MOI) of listed homes for sale varied along the border but normalized for homes priced between $100,000 and $200,000. This price cohort accounts for the highest proportion of border housing activity and provides a clearer picture of supply conditions than aggregate levels. In Brownsville and McAllen, the MOI for this cohort flattened at 6.6 and 6.3 months, respectively, around a two-year equilibrium. The El Paso MOI was stable in this cohort, hovering around 5.6 months, while the Laredo metric climbed for the fifth consecutive month to 4.3 months. In general, supply conditions tightened in both the new and resale markets. The new home months of inventory fell to 10.4 months in McAllen but remained elevated from weak sales for homes priced above $200,000. The Laredo MOI retracted its third quarter gains, falling to 3.7 months as permit growth slowed. New home inventories ticked down to 7.6 months in Brownsville, while the new home MOI bucked the trend in El Paso with a 3.4 percent increase to 6.8 months. In the resale market, the Brownsville and El Paso existing home months of inventory hit records lows at 7.5 and 5.0 months, respectively, as the number of annual active listings trended downward. The Laredo MOI hovered around 5.3 months, providing relief from new home shortages. On the other hand, surpluses persisted in McAllen where the resale MOI surpassed 8.8 months. Housing demand strengthened as the average number of days on market (DOM) trended downward or flattened in the border metros. Laredo homes sold the fastest, averaging just over two months on the market, while the total DOM converged at 94 days in both El Paso and McAllen. The DOM was lowest in Brownsville at 116 days, but the bulk of the market (comprised of homes priced $100,000-$200,000) maintained a DOM of 95 days. In contrast with the Texas Urban Triangle, new home demand outpaced the resale market. The new home DOM dropped to 46 days in Laredo, down 34 percent on the year. In Brownsville and McAllen, the metric settled at 77 and 74 days, respectively, while dropping to a five-year low of 102 days in El Paso. In the resale market, the existing home DOM increased in every metro but Brownsville, where the average home sold after 107 days. Resale demand in Laredo and McAllen softened for the third straight month, elevating the DOM to 70 and 97 days, respectively. El Paso was the only metro where the existing DOM held steady below that of new homes at 90 days. The median home price for existing homes softened within the border economies. The median price fell below $120,000 in Brownsville, down 5.5 percent from its October 2016 peak. In Laredo, the median flattened well above the other metros at $163,091. McAllen took the largest price hit as the median fell more than $7,000 to $133,565. Increased demand for resale homes in El Paso supported marginal YTD median price growth at just 0.9 percent, lifting the median resale price to $131,276. The new home median price converged around $171,000 in McAllen, Laredo, and El Paso but trended upward, downward, and flat, respectively. The Brownsville median ($180,897) topped the remaining metros for the first time in series history, surpassing 11 percent YTD growth. The price increase coincides with demand shifts towards new homes and recent wage growth in Brownsville. Border housing prices and wages remained among the lowest in Texas as well as the United States. However, housing affordability issues persist amid below-average income levels. 1 Monthly numbers are reported instead of a three-month moving average for consistency. 2 Official numbers are reported instead of a three-month moving average for consistency. Parenting experts say that involving children in the execution of household chores teaches them responsibility and gives them a sense of accomplishment. It also helps cement their role in the family by helping them feel they are contributing to the household. But how young is too young to start children out with their own designated chores? Parents ultimately know best, but experts agree that children as young as two can start learning simple tasks that help out mom or dad. As long as each task attempted is accompanied by specific instructions, realistic expectations, and copious praise, you can teach your children these age-appropriate household chores. Household Chores for Children Aged Toddler to 5 years. Kids this age can utilize household chores to learn other skills like matching sizes, shapes and patterns, and developing fine motor skills. Piling books and magazines, matching socks, folding washcloths, putting toys away, and putting their laundry in the hamper are all good starter chores for little hands. Household Chores for Children Aged 6 and up. By this age, children have already mastered hand-eye coordination and advanced motor skills, and understand the concept of time. Rely on your child to set the table for dinner every night at a designated hour, clean their own room (make sure you both understand what you mean by “clean”), feed/exercise pets, take out the trash, clear the table, load and clear the dishwasher, put away groceries, help prepare dinner, pack their own lunches, change their own bed sheets, and water plants. Out of doors they can pull weeds, rake leaves, get the mail, and help shovel snow. Children this age can also help with younger siblings by helping them put on jackets and tie their shoes. Lastly, experts discourage rewarding children with money for completing regular household chores because they are routine tasks that are mandatory for the whole family. If you want to set up a rewards system, offer your child monetary incentives for doing extra chores above and beyond assigned responsibilities. You can even create a fun chart to keep track of bonuses (and then use the opportunity to teach kids about the value of money). When doing chores with your child, don’t forget the most important thing – praise. Children of all ages glow with pride at words of approval from their parents (so soak up the adulation before they become teenagers and want nothing to do with you). As the saying goes, “many hands make light work,” but many hands working together also equals time spent together as a family, a treasure far more precious than a spotless house. Buying a new home can be a smart and satisfying financial goal. Is becoming a homeowner for the first time or finding your next dream home one of your heart’s desires? Aiming for a big picture strategy and breaking your plan into steps over time can help make your homeownership goals a reality. If you don’t see yourself making a move for quite some time but know you’d like to buy a home down the line, following are proactive steps you can take sooner rather than later, along with some ideas to keep in mind. Buying a home is a huge financial investment that requires planning and commitment. Checking your credit score early in the process is an important step. When you apply for a loan or are looking into a mortgage for your new home, one of the first things lenders will check is your credit score. You don’t want to be surprised, stalled, or have a loan rejected because of factors impacting your credit score that you could start tackling now. If you’re based in the United States, you can check out all three of your credit reports free of charge from AnnualCreditReport.com. If you’re based in Canada, you can go to the two national credit bureaus, Equifax Canada and TransUnion Canada. Checking on your credit score in the beginning stages — when you are only thinking about buying a home — will allow you to take a proactive approach if you are looking to considerably improve your credit score. Doing so will put you in a much better position when it comes to applying for a home loan. When you start the process early, you can also begin to pay off other debts you might have, whether that is other loans, credit cards, etc. This will free you up to put more of your energy and money towards the new home instead of being limited by older debts. You’ll also want to take the time to thoroughly research mortgages and home loans that are right for you. Not all loans are created equal: there are varying interest rates, stipulations, repayment plans, and other factors to consider. Keep your long-term plans, your income, and your family situation in mind. 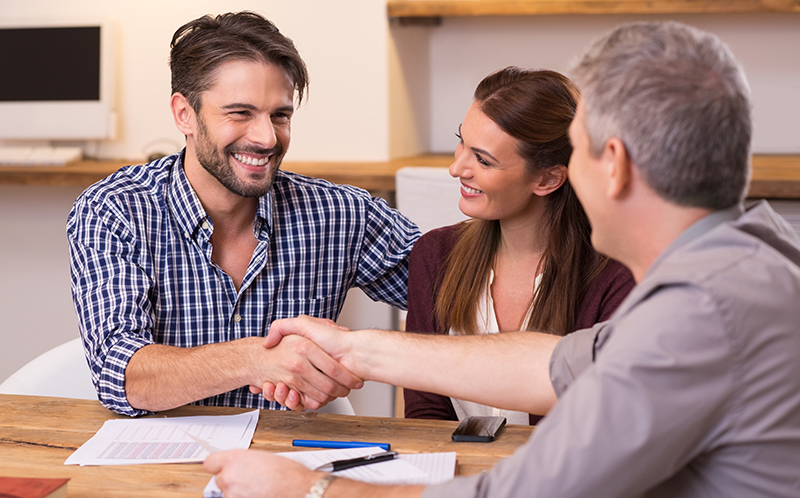 Choosing a loan officer and real estate agent early on will connect you to some of the best resources and most up-to-date information so you can better understand your options. Understanding the types of personal and financial information you’ll most likely need to have on hand when the time comes to start a serious home search will help you get organized and stay one step ahead of the process rather than scrambling to track down important documents. Beginning to save for a down payment as soon as possible can make what might otherwise feel like a major cost become a much more achievable goal. Depending on your mortgage, you’ll be required to pay a minimum down payment. This is where connecting with your real estate and mortgage industry professionals in advance can help you get a good estimate of what your price range and actual down payment might be. Having a clear dollar amount in mind can help you budget early in order to reach your goal over time. Be sure that you don’t make any other large purchases before taking out a home loan. You’ll want to avoid major spending throughout the home closing process as well. If you aren’t sure what might make a negative impact, consult your home loan professional ahead of time so you can plan expenses accordingly. Taking on other hefty payments will not only stretch your finances thin, it can also make it harder for you to get approved for a loan or close the deal. Some important, larger purchases of course cannot be put off forever. As you begin to search for the perfect house, knowing how much home you can afford can help you stick to your limits and better plan for other major expenses you may want to budget for in the years to come, such as auto payments or new furniture. Moving to a new home can often mean moving to an entirely new area, new city or across the country. If you have kids, you’ll likely want to do some research on the schools in various areas you’re considering moving to. School district boundary lines may rise to the top of your list as the deciding factor for the neighborhood you ultimately choose. Another important thing to consider is your potential new neighborhood’s proximity to your work. Think about how long your commute would be from various areas and whether it is economical to travel from your new home’s area to your workplace. You should also know whether you would have access to public transportation or whether you would depend on having a car. Some other things to research are the population size and the general feel of areas you’re considering moving to. Is having a bustling town important to you? Do you want to live somewhere that offers a lot of things to do? Or are you more content in a small, quiet town? These are all important questions to ask yourself and other members of your household well before you are ready to make an offer on a new home or decide on a new neighborhood. Before you buy a new home, you have to think about the one you’re in now! Make an imminent move easier on yourself and your family by getting rid of any clothes, household items or belongings that you don’t need or use anymore. This means less stuff to pack and move later, which means less stress for you. This is especially true if you’re planning on downsizing your living space. You don’t want to move into a house and literally not have room for all of your stuff. Be smart about what you really need and what can be given away. Decluttering is a process you can start early and may also make your current living arrangement more enjoyable. If you already own a home, outlining what you’re going to do with your current home once you are closer to making your next move is another proactive step your can take. Are you going to sell your current home? Rent it out? A local real estate expert can help you sort through your options. Planning in advance will make it easier to focus on buying a new home when the time comes. This post was written for Realty Executives by Elliot Walsh. Elliot is a dual-degree graduate from the University of Rochester with a B.S in Cell Biology and a B.A in English Literature. He is a full-time freelance writer from Boston, specializing in veganism, humor, and health. His articles have appeared in The Rival Rochester and his work experience can be found here: www.linkedin.com/in/ewalsh17.